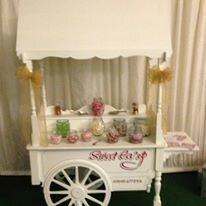 Designed and built in Wales, these characteristic traditional carts will be marvelled in any event. The jars are filled with all your childhood favourites bought from the most popular famous brands. Beautiful bows to match your colour scheme and a choice of plain white or traditionally striped roofing.